Our staff just discovered that there is more to Fontainebleau than the world famous palace! Whilst visiting France, many of our clients like to take in one of the Parisian palaces of Versailles or Fontainebleau and most tack those visits on to a stay in Paris, rather than during their campervan trip. 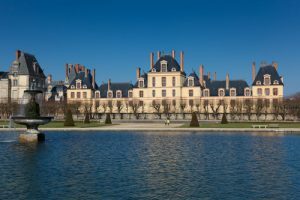 However, a mere 55-minute drive from the FMH depot, you can very easily visit Fontainebleau in your campervan and we have found there is much more to this lovely area than just the beautiful palace. 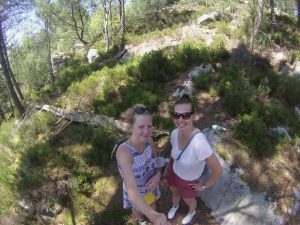 FMH’s Customer Service Administrator, Iva, and Housekeeper, Michaela, spent last weekend in Fontainebleau forest walking and boulder climbing (yes, really – just 60 km from Paris!) And they enjoyed a stay at a great campsite with a pool in the forest. The forest is a vast nature lover’s paradise and offers more than 1600 km of walking trails (300 km of which are signposted). 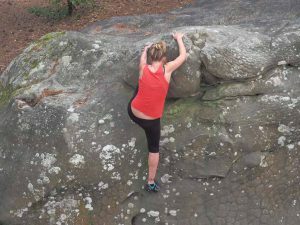 Boulder climbing options are some of the best in Europe and range from beginner to advanced levels with hire equipment available in the town. Find out more about Fontainebleau’s forest and the activities on offer here. Iva and Michaela stayed on the “La Musardière” campsite about 15 km from Fontainebleau town, so bring or hire some bikes if you stay here to get into town and see the palace. There are campsites closer to the palace/town and they are listed on the local tourist information website which also has heaps of other interesting information about the town, palace, forest and villages of the area. Fontainebleau town is also a great place to shop, dine and people watch and is host to many interesting live events from music to show jumping. No wonder eight centuries of French royalty took their fresh air here! Why not follow in their footsteps and enjoy a visit to Fontainebleau during your campervan trip?